30.00 mm 18K white gold case, 8.11 mm thick, diamond bezel, diamond paved dial, caliber 1202 quartz movement with minutes, hours, black satin strap, ardillon buckle. Water resistant to 3 bar. 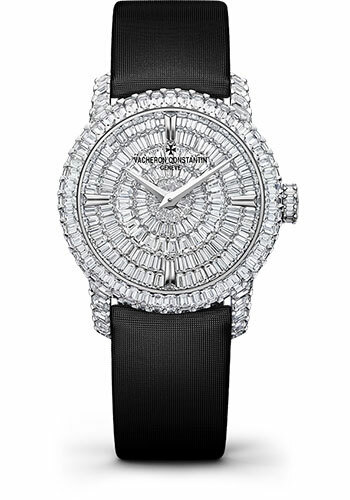 30.00 mm 18K white gold case, 8.11 mm thick, diamond bezel, diamond paved dial, caliber 1202 quartz movement with minutes, hours, 18K white gold bracelet set with diamonds. Water resistant to 3 bar.